Lewis County Republican Party Chair Benjamin L. Harrison said there has been some confusion, and misinformation, concerning the recent selection of a property valuation administrator (PVA) following the recent retirement of Anthony Silvey from the post. Harrison said he drafted a memo that outlines the process the Republican Party undertook to choose their nominee for Lewis County PVA. On the same day the committee met to choose a nominee, Gov. Matt Bevin made an appointment to fill the position until the midterm election in November. Harrison, who serves as Lewis County Attorney, said while the selection process is straightforward, the naming of an interim PVA by the governor resulted in some confusion on the matter. He added he hopes the memo will help to answer any questions concerning the process. “The purpose of this memo is to outline the timeline and process that the Lewis County Republican Party undertook to choose the Republican nominee for Lewis County PVA. “The filing deadline to file for county-wide office was on January 30, 2018. Anthony Silvey resigned as Lewis County PVA effective April 30, 2018 and subsequently withdrew his name for the Republican nomination for Lewis County PVA. Mr. Silvey was the only candidate that filed for the Republican nomination for Lewis County PVA prior to the January 30, 2018 deadline. “Once a nominee for office has withdrawn his name as a candidate after the filing date of the primary election, state law requires the county party committee choose its nominee for the general election. Therefore, the job of choosing the Republican nominee for Lewis County PVA fell to the Lewis County Republican Party County Committee. “Rule 4.01 of the Republican Party of Kentucky states that membership of the County Party Committee shall consist of Precinct Officers and the County Officers. Precinct Officers include three positions per precinct: captain, co-captain, and youth captain. The Officers of the County Party, according to Rule 4.02 are as follows: Chairman, Vice-Chairman, Secretary, Treasurer, and Youth Chairman. “County Committee members and Officers were chosen at the reorganization meeting held on March 25, 2017 pursuant to Rule 5.01 of the rules of the Republican Party of Kentucky. The County Committee undergoes reorganization every four years. 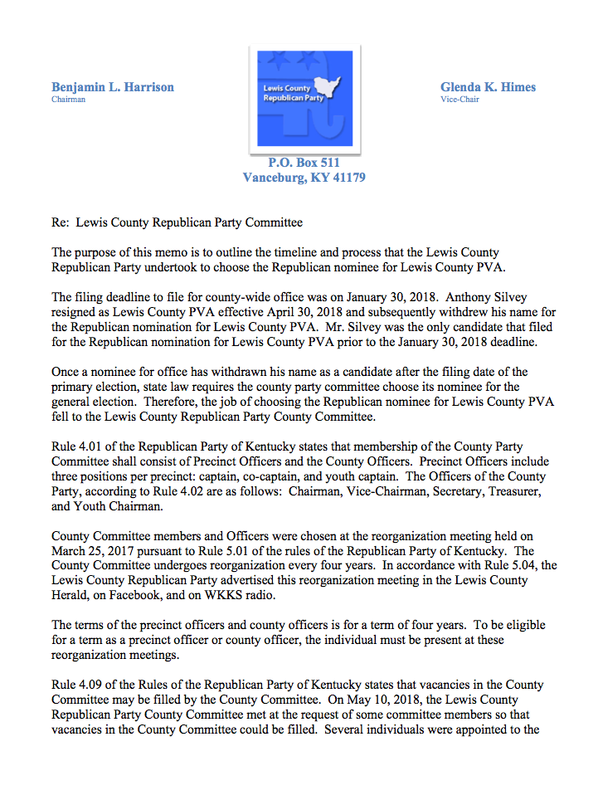 In accordance with Rule 5.04, the Lewis County Republican Party advertised this reorganization meeting in the Lewis County Herald, on Facebook, and on WKKS radio. “The terms of the precinct officers and county officers is for a term of four years. To be eligible for a term as a precinct officer or county officer, the individual must be present at these reorganization meetings. “Rule 4.09 of the Rules of the Republican Party of Kentucky states that vacancies in the County Committee may be filled by the County Committee. On May 10, 2018, the Lewis County Republican Party County Committee met at the request of some committee members so that vacancies in the County Committee could be filled. Several individuals were appointed to the County Committee in accordance with Republican Party rules. The total membership of the Lewis County Republican Party County Committee after this meeting was 43 members. “State law requires candidates for PVA pass a standardized test to be administered by the Kentucky Department of Revenue. The special examination for Lewis County PVA was held on May 11, 2018. On May 12, 2018, the Department of Revenue released the names of those individuals that passed the special examination for Lewis County PVA: Eric M. Bloomfield, Cory Lee Christy, Benjamin Lee Ginn, Daren Hall, Kenneth Ruckel, and Brandon Singer. “On May 14, 2018, Governor Bevin announced that he appointed Eric M. Bloomfield to the position of Lewis County PVA to serve until the new term of the Lewis County PVA begins (December 3, 2018). 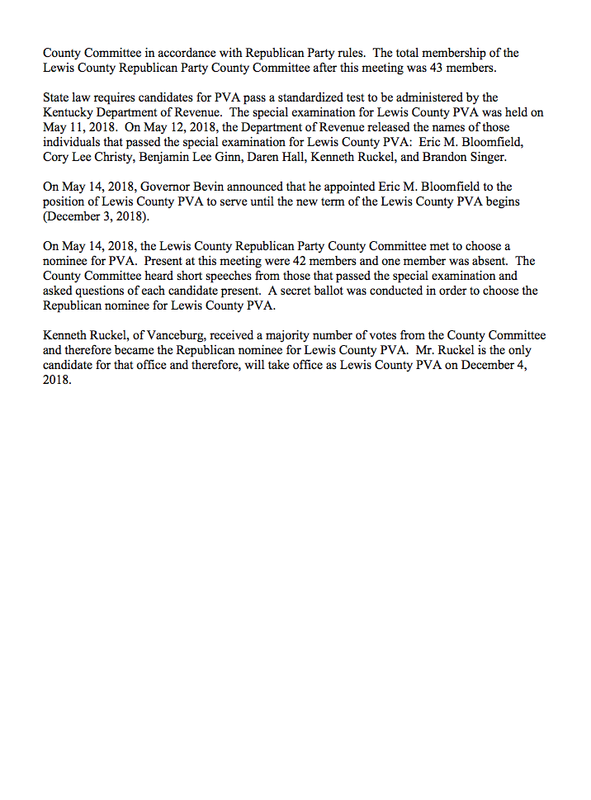 “On May 14, 2018, the Lewis County Republican Party County Committee met to choose a nominee for PVA. Present at this meeting were 42 members and one member was absent. The County Committee heard short speeches from those that passed the special examination and asked questions of each candidate present. A secret ballot was conducted in order to choose the Republican nominee for Lewis County PVA.